Walt Disney Pictures has released this new behind-the-scenes featuette on Pirates of the Caribbean: On Stranger Tides. The featurette starts off with a look at the original ride at Walt Disney World and features Walt Disney himself showing it off to an employee. We then get to see some behind-the-scenes images of the cast filming, including Johnny Depp coming to the set in a helicopter! Whoever is making these trailers is someone who completely, totally, and wholeheartedly understands the meaning of the word EPIC. No other words can describe. either way, it was still composed well enough to get me insanely excited...again! ‎"Admit it Jack. You still love me." "You walk like a girl!" HAH! I think I'm starting to like Angelica a little better. 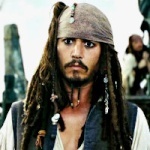 Yahoo has your first clip from Disney’s “Pirates of the Caribbean: On Stranger Tides”, featuring old buddies turned enemies turned old buddies and now, it seems, turned enemies again Barbossa (Geoffrey Rush) and Captain Jack Sparrow (Johnny Depp). Them’s some fancy moves, Jack. I love it! It's full of treats for repeat viewings! From the king cowering from getting cream puffs on him, the window escape plan not turning out quite right, Barbossa's look of despise/jealousy, and Jack consciously grabbing the cream puff before leaving. I love little moments like these that give repeat viewings a chuckle-every-time. I know I'm going to yell out at some point in the future " HE's SO MAD! " at that teeny tiny microscopic Barbossa glace. It's all great! I also love how it seems like they played with the " Do you think he plans it all out or makes it up as he goes along?" theme, seeing as he went for the window and then had to change course after that other guy came sliding in his direction. The music is a little bit to orchestral and dramatic for the scene, I feel, but that's fine. As long as it's entertaining! And it is! I think this scene would be a whole lot more exciting if we saw the whole thing, not just the escape part. The dialogue before the clip has got to be just fantastic. The music was more exciting then the scene was. Aye, that be true... oddly enough, for a director who's used to doing musicals, I found the editing was a bit sloppy and the scenes a bit cut up. I remember reading an article with Jerry or someone saying that he's a master of capturing movement or something like that and I think this scene wasn't as much as it could be, technically speaking. However, I must add, I also love the soldier who yells " come back! ". Those kinds of things also crack me up... like in Tangled when Flynn Rider steals the crown and escapes and the guard yells " Hey! Wait!!! " These kinds of guys are as amusing to me as the obligatory impractical jumping ship guy with the stock scream that's in almost every battle scene. I rather liked it, all-told. Perfect it aint, but it definitely looks fun. My biggest gripe was how the heck did Jack manage to completely take out the two guards behind him with a couple quick backhands to the... what... stomach? Groin perhaps It just seemed sort of like they said, "Alright, so Jack's got two guards flanking him... but we need him to escape... and... well, we don't have time to write him a really good trick, so this will have to do."